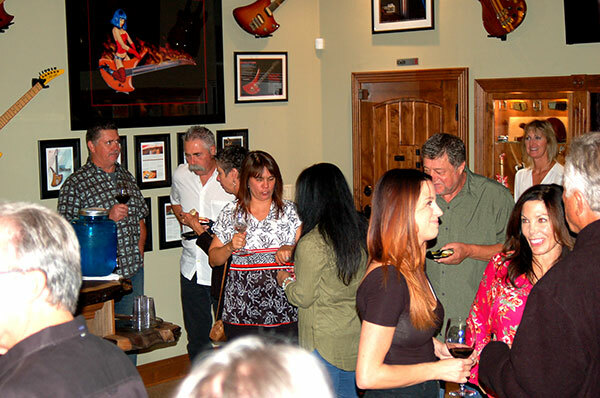 Guests at the Grand Opening of the Gary Kramer Guitar Cellars. 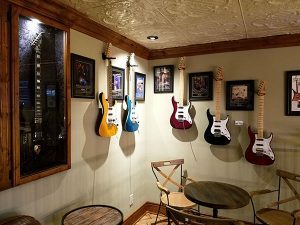 —Last week a new celebrity museum and fine wine establishment opened in Paso Robles with the launch of the Gary Kramer Guitar Cellars, a welcome addition to the local viniculture scene with wine tasting, olive oil tasting and what may be the most unique musical museum anywhere in the county. Moreover, the Kramers have assembled their new digs with precision and taste, all burnished wood surfaces and attention to detail. It’s what you would expect from a famous guitar maker—this is a beautiful place to relax, unwind and sample fine wines, cheeses, olive oils and other victuals. One could think of this as a “salon” in the original French sense of the word, where thoughtful conversations among people in the know take place over a glass of wine. 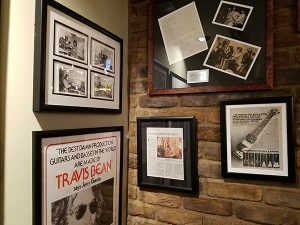 Guitar memorabilia in the second floor lounge at Gary Kramer Guitar Cellars. You may remember the name Kramer Guitars for their design and manufacture of some pretty snazzy axes, played by the likes of Mick Jagger, Jerry Garcia, Eddie Van Halen and a whole generation of musicians who swore by Kramer aluminum-necked and wooden-necked guitars and basses, some of the best for hard rock and heavy metal in the 1970s, 1980s and beyond. Several of those famous instruments now adorn the walls of Gary Kramer Guitar Cellars, at 825 Riverside Avenue, Suite #16 (get it? 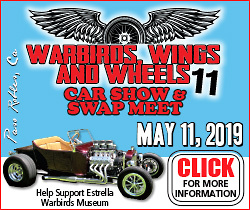 ), right here in Paso. One lounge area is dedicated to Eddie Van Halen, Kramer says, because Van Halen did so much for the electric guitar. You might say the same for Gary Kramer, whose brand became one of the largest ever. The museum-salon is a two-story affair with two individual rooms for lounge lizards, card sharks and anyone who loves a good wine and cheese pairing. 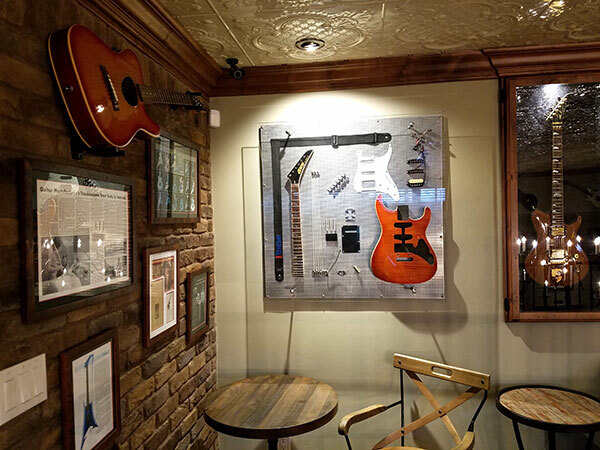 The walls feature more than 50 rare and custom one-off guitars, plenty of never-before-displayed music memorabilia (including a circa 1975 handwritten order for guitars from Mick Jagger), and a top-shelf sound system for the music that Gary Kramer himself programs for his guests. So how did a world-class guitar designer-engineer wind up in the North County? Yes—this is another “I had enough of L.A.” story—if we only had a buck for every refugee fleeing Southern California to move up to beautiful, pastoral north San Luis Obispo County, right? 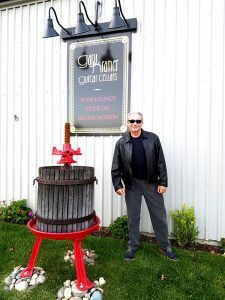 Gary Kramer out front at his new “Cheers”-style Guitar Cellars. So it was that Gary and Laura Kramer wanted to retire along the Central Coast, and happened upon a ranch for sale in San Miguel. They moved up, dubbed it the Rockin’ K Ranch, and spent some time getting accustomed to the rural lifestyle, complete with horses, chickens, goats and a sports car collection. But Kramer has always been the creative, “I can’t sit around doin’ nothin’” sort of guy, an artistic entrepreneur at heart. Eventually the Kramers planted olive trees and vineyards, and lo and behold, soon enough the placid Kramer ranch became a veritable hive of activity. Kramer Guitar Cellars is most proud of their 2013 Syrah. 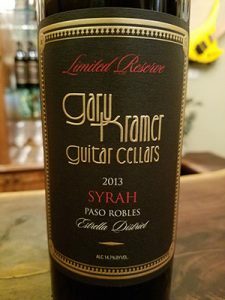 Gary Kramer Guitar Cellars features its own custom label of small-batch red and white wines, including syrah, cabernet, cabernet franc, grenache, tempranillo and albariño. They also feature some of the finest olive oil native to this region. When you go in, ask for the Lacrime di San Miguel (so good dipped in fresh bread, you may cry over it), and pair it with a glass of their 2013 Syrah, which is rich and deep, fruit forward with a hint of blackberry. Kramer grew up in idyllic Los Angeles in the days when Inglewood was still a plush suburb, reachable by cable car from bustling downtown. His New York-born father’s family was from Paris and Switzerland, and his Italian-born mother’s family hailed from the southern Naples region. The young Kramer grew up with a nose for gastronomy in an era when American diner food was at its zenith, making him something of a connoisseur early on. Though Gary Kramer was never a rocker himself, he was a scion of the times, a guy with a knack for design and business. Back in 1974, in his mid-20s, he met novice guitar designer Travis Bean. Their guitar-building empire started off strictly grassroots, with some money Kramer had saved from exporting cars to Australia. Then they got a booth at their first NAMM show—National Association of Music Merchants, the biggest music convention there is. There, the Bean-Kramer guitar prototypes landed them nearly $500,000 worth of advance orders. Eventually an investor named Henry Vaquero financed the growth of the business, and for a while it was actually owned by Michael Jackson. Vaquero reacquired Gary Kramer Guitars from Jackson and subsequently sold it to Gibson, which has produced the Kramer line since 1989. 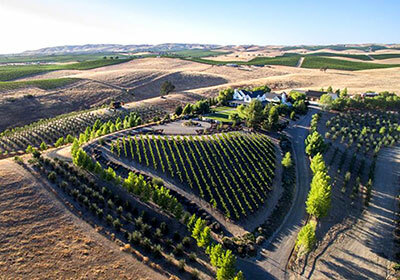 The Rockin’ K Ranch includes vineyards planted in a heart shape for his wife, Laura. The Kramers moved to North County a few years ago and now they grow most of their own grapes and harvest all their own olives. At Gary Kramer Guitar Cellars the kitchen is serving some of the finest imported meats and cheeses from France, Italy and Spain for olive oil and wine pairing. The new spot on Riverside Ave has become that embodiment of the Kramer aesthetic. 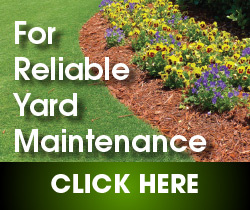 For hours and more information, visit http://www.garykramerguitar.com/, call (805) 238-0083.